These businesses prove that high risk is not always a requirement for investment rewards. Sophisticated investors define risk as the possibility that an investment will result in a permanent loss of capital. One of the best ways to dampen risk, therefore, is to invest in businesses with diverse revenue streams and steady cash flows that can be counted upon in all manner of market environments. The three businesses that follow excel in this regard. Perhaps no other company is as broadly diversified as legendary investor Warren Buffett's jewel, Berkshire Hathaway (NYSE:BRK-A) (NYSE:BRK-B). The megaconglomerate owns more than 60 different subsidiaries spanning industries as varied as insurance, utilities, railroads, and retail businesses, among others. This broad sector diversification helps make Berkshire able to withstand even the most turbulent market conditions. In fact, it's during these volatile times that Berkshire is best able to deploy its massive cash reserves into value-creating investments. One example is Buffett's purchase of $5 billion worth of Bank of America (NYSE:BAC) preferred stock during the depths of the financial crisis. That purchase also included warrants to purchase 700 million shares of Bank of America common stock for $7.14 a share at any time before Sept. 2021. At current prices, those warrants are worth around $11 billion, meaning that Berkshire's investment in Bank of America has already more than tripled in value. And with $86 billion in cash on Berkshire's balance sheet, Buffett remains on the prowl for new investments that could create even more wealth for the company and its shareholders. Impressively, even at age 86, Buffett continues to learn and grow as an investor. After mostly shunning the technology sector for decades, Buffett recently took a massive stake in tech titan Apple. And although he (wisely) avoided the major airlines for much of Berkshire's existence, Buffett recently disclosed investments in several airline stocks after consolidation reshaped the competitive dynamics of this once beleaguered industry. This ability to adapt to a changing investment landscape further lessens Berkshire's risk, and strengthens the company's ability to deliver excellent long-term returns to its investors. Anheuser-Busch InBev (NYSE:BUD) is the undisputed king of beer. After its recent $100 billion acquisition of SABMiller -- its former No. 1 competitor -- AB InBev's portfolio of more than 500 beers commands nearly 30% of the global beer market, including seven of the top 10 global beer brands. AB InBev's strength lies in its unmatched distribution system. The company sells its beers in more than 150 countries, making it the world's first truly global brewer. This broad geographic footprint helps to reduce AB InBev's risk profile, in that sluggish sales in some areas of the world can be offset by stronger results in others. For instance, the merger with SABMiller has strengthened the company's presence in high-growth emerging markets like Africa, which are helping to offset tepid sales in countries currently struggling with economic woes, such as Brazil. The risk to AB InBev's growth-through-acquisition strategy is further lessened by its proven track record of operational success. The company excels at slashing costs and boosting profits at the businesses it acquires. In this way, AB InBev is able to create long-term value for its shareholders, even after acquiring these companies at substantial premiums. That's a rare ability, one that -- when combined with its dominant presence in many of the world's emerging markets -- helps to make Anheuser-Busch InBev an excellent stock to own in the years, and even century, ahead. 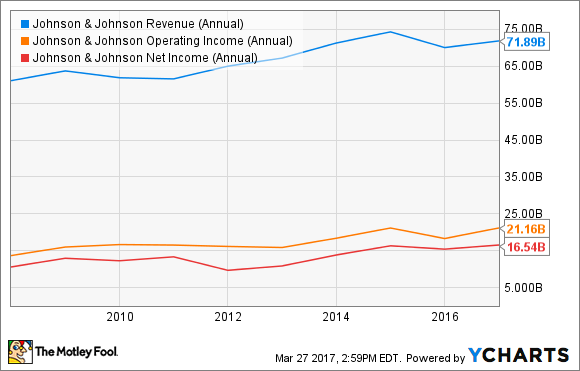 Johnson & Johnson (NYSE:JNJ) is another great low-risk business with highly diversified revenue streams. The healthcare giant's empire spans three broad segments -- pharmaceuticals, medical devices, and consumer products -- and comprises more than 250 operating businesses in 60 countries. JNJ Revenue (Annual) data by YCharts. Additionally, Johnson & Johnson's strong cash flow generation -- combined with its more than $40 billion in cash reserves -- allows it to invest aggressively in research and development, as well as in the acquisition of promising new drugs and technologies. In 2016, J&J's $71.9 billion in revenue produced $15.5 billion in free cash flow, which in turn allowed it to allocate more than $9 billion to R&D and $5 billion to acquisitions and licensing deals. These moves help to further fortify J&J's already strong pipeline and position the company for continued growth. It's a powerful virtuous cycle -- cash flow is directed to value-creating research and acquisitions, which help to generate more cash, which can be reinvested, and so on -- that has served Johnson & Johnson's shareholders well for decades, and that should continue to do so for decades to come.